Offering Mt Yotei views, Yuki-Otoko is located close to the free shuttle stop in the Izumikyo 2 area just out of the main Hirafu village. The property has three bedrooms. The first floor has a spacious living-dining area adjoining the well equipped kitchen, separate bath-shower and washstand area. 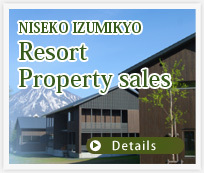 A great choice for those wanting an affordable Niseko stay. 1 bedroom guests are accommodated in comfy futons set on the floor.Mt Yotei views may be impeded by snow banks depending on levels.